Larry Hoppen's message to the fans. Orleans wishes all our European fans - especially those in France, Germany and Holland where we played each for the first time this past year - a joyous and peacefull Christmas and a wonderful 2009. Orleans would not be in our 37th year (hey, who's counting? ;-) without YOU, our fans. THANK YOU so much !!! We hope to see you in the coming year. The music of Bruce Hibbard has been sung and recorded by dozens of inspirational artists. From Roby Duke to Amy Grant, from the Imperials to Jaci Velasquez, his songs have interwoven Christian music for the last three decades. Heaven's Gold Collection is Bruce's first Christian musical release since 1981. The music contained on this new CD spans his entire writing career. Songs like "The Treasure", written in 1982 and "I Live" recently penned in 2007. Music has always been a part of Bruce Hibbard's life. Growing up in a musically diverse family allowed him to be introduced to different instruments and varied styles of music at a very early age. His parents have been involved in church work in Oklahoma City for over 45 years. Bruce began playing in church at the age of 12 and was writing Christian music by his late teens. As his musical talents developed, he began working with other local musicians, playing in groups such as Ascension and Sonlight. By his early twenties, Bruce was involved with and traveled extensively with The Amplified Version, The Paul Clark Band and Phil Keaggy and pursued his own personal artistry. Some of Bruce's early musical friends and mentors were Harlan Rodgers, Hadley Hockensmith, Bill Maxwell, Kelly Willard, Jonathan David Brown and Keith Edwards, all of whom resided in Oklahoma City during those days. A Light Within, Bruce's first album, was released in 1977. This project contained many songs that were recorded by other artists. He was soon signed by Word Records as a staff writer and his position eventually led to an artist deal. In 1981 Word released Bruce's second album on the Myrrh label, Never Turnin' Back. Co-written and produced by Hadley Hockensmith, Never Turnin' Back was a critically acclaimed CCM album which produced three hit singles. You're So Good To Me, a #1 single, remained in the top ten on national Christian radio for over two months. Bruce's extensive writing career includes covers by Amy Grant, Jaci Velasquez, Scott Wesley Brown, The Imperials, Andrus Blackwood and Company and many more. In Time is the first album of new music recorded by Danny O'Keefe in eight years. An incredible return by this veteran singer/songwriter who's best known for his 70's hit Goodtime Charlie's Got The Blues. This new album, finds the artist in fine voice with an entire album of new songs, written in collaboration with some of Nashville finest songwriters. The production has the classic O'Keefe sound and his longtime fans should welcome this new CD with open arms. The world discovered America in 1972, when a nameless horse began its gallop across the international airwaves. If this sounds like some sort of fairy tale, it seemed like one for the young musicians who harmonized their way to the top of the charts on the strength of this song. "A Horse With No Name" made the band called America famous in the United States, Europe, and beyond, leading the way for an impressive string of hits to follow. Slightly more than a year after launching their group, Gerry Beckley, Dewey Bunnell, and Dan Peek were riding high, thanks to a sound that mixed rock, pop, and folk elements to instantly appealing effect. America's albums--six of them certified gold and/or platinum, with their first greatest hits collection, History, reaching the four-million sales mark--displayed a fuller range of the trio's talents than did their singles. From effects-laden rockers to oddball medleys and soul-bearing ballads, their reach was wide and ambitious. Live at Wildwood Springs includes all of America's greatest hits, including "A Horse With No Name", "Sister Golden Hair", "Ventura Highway" just to name a few. The special concert is all-acoustic and one of a kind. Frontiers Records is proud to announce the return of BALANCE with the release of the band’s anticipated new album entitled “Equilibrium” on February 20th 2009. The Melodic Rock and AOR scenes are both made up of legendary albums and bands, which, as time goes by, become even more respected among the community of fans. Balance are exactly one of these bands, whose name and reputation, like good wine, has stood the test of time for more than two decades. Formed at the end of the 70’s by three promising talents out of the NY music scene: singer Peppy Castro (formerly of The Blues Magoos, Wiggy Bits and Barnaby Bye), the classically trained keyboardist Doug Katsaros and guitarist Bob Kulick (who had already appeared as a guest musician on KISS recordings and on the Paul Stanley solo album in 1978 as well as playing in Meat Loaf’s band), Balance soon inked a deal with Portrait Records who released the band’s first eponymous album in 1981. While the song writing and production quality shone all over the record and the band were immediately on the same level as contemporary luminaries such as Toto, Survivor or Journey, the album for which Balance are still today highly regarded is the follow up “In For The Count” released in 1982. The line-up was completed by former Speedway Blvd. member (the band that also featured the future Dream Theater keyboardist Jordan Rudess) Dennis Feldman on bass and Chuck Burgi (ex Brand X and later with Rainbow and Red Dawn) on drums. On “In For The Count” the band kicked in with heavier guitars and outstanding production skills, with a song writing talent that was not afraid to experiment while still keeping their strong Melodic Rock trademark intact. In a perfect world that record should have catapulted Balance to the same level of popularity as Journey, Foreigner or Survivor, however fate and the label’s lack of support decreed the end of the band. As proof of the multi-talented artists involved in Balance, all members went on to brilliant careers in music in the following years. Kulick, continued collaborating with the members of KISS and Meat Loaf and went on to form Skull and Murderer’s Row, before becoming a Grammy Award producer in LA. Katsaros played, sang & arranged for KISS, Rod Stewart, Cher, Bon Jovi, Sinéad O'Connor and Aerosmith among others and worked in several rockin' Broadway shows, including The Rocky Horror Show and Footloose. Peppy collaborated and sang on records by Diana Ross, KISS, Laura Branigan and Michael Bolton before starting to work in the jingles business. The three of them kept in touch and had the chance to work together on several projects, however they could never resume the Balance concept and complete their musical circle, so as soon as they got a proposal from Frontiers Records, and after the recent reissue of their classic “In For The Count” album on Rock Candy / Universal, they decided the time was right to start working again, in Doug Katsaros words, on “tunes mostly originally written for a third album, and shelved at the collapse of the record company”. JAR (feat. Jay Graydon & Randy Goodrum) first video "Heartbreak"! 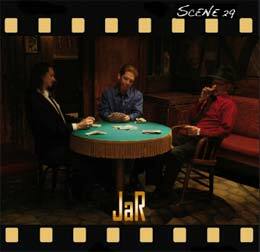 Jay Graydon (Airplay, Planet 3) and Randy Goodrum (Chicago, Steve Lukather) released together as the supergroup JaR their first album. A melodic masterpiece with songs across the board - a mixture of Pop, R&B, AC, AOR and Jazz. It is superbly crafted, loaded with original, sophisticated, catchy songs, with subtle harmonies and interesting melodic hooks. Enjoy their first video where they perform "Heartbreak"! To coincide with the upcoming holiday season, Canadian icon and JUNO Award winner Marc Jordan will release a special single entitled ‘Every Time It Snows.’ Penned in collaboration with Don Breithaupt, the single drops today. It is being serviced to radio and is available on iTunes and other digital channels. Frequently praised for the emotional and poetic quality of his lyrics ‘Every Time It Snows’ is classic Marc Jordan - showcasing his unique vocal style and jazz sensibility. A bonus track on the CD is Marc’s cover of the timeless standard ‘Have Yourself A Merry Little Christmas’ which was produced by his wife Amy Sky. Having written for Rod Stewart, Josh Groban, Cher, Natalie Cole, Molly Johnson, Bette Midler, Amanda Marshall, Bonnie Raitt and Diana Ross, Marc Jordan’s resume reads like a list of who’s who in music. A JUNO Award winner and the first recipient of Male Vocalist of the Year by the Canadian Smooth Jazz Awards, Marc has also carved an impressive career as an artist with eight successful solo albums. Little green was formed by Thomas Pontén (mandolin, guitars and vocals) and Andreas Johannesson (Lead vocals and guitar) in Gothenborg. At first in more of a singer-songwriter-style but they gradually transformed into a country/bluegrass-act. Soon they felt the duoformat to be a bit limiting, and they brought in other musicians with Thomas and Andreas remaining as core members. Other members are Karl Wassholm (bass), Fred Sörensson (fiddle) and Johan Hjalmarsson (drums). Little green gets their own sound through their wide range of influences and a fair amount of disrespect for tradition. The lyrics are usually quite dark and brooding, and reek with some ”Swedish melancholy”. The music however, is often stirring and catchy with simple but effective vocal harmony. Some of their influences are: Darrell Scott, Tim O´Brien, The Greencards, Nickel Creek, Dixie Chicks, Steve Earle and Neil Young. The band have played a number of gigs, and has reached the finals in the swedish championships of country-music for two years straight. 2006 they participated in the alt country-genre and in 2007 in bluegrass. Little green is now pleased to present their new album “Crossing lanes”. Ralston Bowles "Rally at the Texas Hotel"
Ralston Bowles’s father played the fiddle, guitar and banjo in the Appalachia hills before he moved to Gary, Indiana to work the Steel Mills. With instruments throughout the house Ralston learned early they were for making music not just hanging around. Ralston's first professional job was at the age of 16 when he was asked to make up one of his story songs for a neighborhood party. After graduation he found himself playing in clubs and coffeehouses throughout the Midwest making up songs about the people and places he visited. His songwriting has been lauded by many, and his songs have been performed and recorded by Caroline Aiken, Peter Mulvey and Rachael Davis. He received numerous awards for his writing from a variety of organizations including American Songwriter Magazine, NSAI/CMT, Unisong and the ISC (International Song Competition) and As A Kerrville New Folk Finalist. He even found himself opening for such artists as Shawn Colvin, T-Bone Burnett and Arlo Guthrie. But it was only after years of coaxing he found himself recording his own material with producer Marvin Etzioni. The recording, "Carwreck Conversations", earned him triple Jammy Awards locally and recognition as best musician in West Michigan by Grand Rapids Magazine. It has also opened doors for his doing more outside the Midwest, and lead him to his first commercial release through Judy Collins’ Wildflower Records. He has become a bi-annual favorite at Boston's Club Passim. He has continued to build on the relationships and music opportunities which has led him completing a second disc with producer Marvin Etzioni (to be released on Wildflower Records late 2008) and includes the talents of Gurf Morlix (Lucinda Williams, Slaid Cleaves, Ray Wylie Hubbard) and Radoslav Lorkovic (Greg Brown, Jimmy Lafave, Odetta) and Charlie Sexton (Bob Dylan).